evening as she prepares to accept her diploma. LONDONDERRY -- Juggling their education with full-time jobs, life’s ongoing challenges and family responsibilities has been no easy feat for the 18 students in the most recent Adult Education class at Londonderry High School. 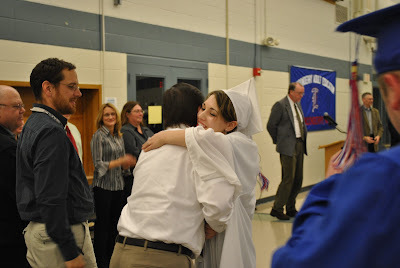 On Wednesday evening, a small ceremony in the high school cafeteria marked a very important milestone for the nontraditional students: their long-awaited high school diplomas. Their stories are as diverse as the students themselves. There’s the teenage mother who struggled to raise her infant while attending traditional high school classes, as well as others who, for various reasons, were unable to thrive within standard school settings. Though most of this week’s graduates come from Londonderry and surrounding towns, others traveled as far as an hour each way to attend the district’s unique program. “This program is really one of the crowning achievements of our school district,” high school Principal Jason Parent said. Londonderry’s Adult Education program began six years ago under the watchful eye of then assistant principal and program director Jason Parent. After Parent was promoted to high school principal during the 2008-09 school year, Warren assumed the director position. Parent said this week’s class is the 13th to complete their studies, with graduates earning bona fide high school diplomas rather than GED’s. Weare resident Bianca Fahlin, one of this semester’s graduates, compared her own struggle to attain her high school diploma to the one waged by her godmother back in 1941. Fellow graduate and Weare resident Erika Wiggins struggled for her initial three years at John Stark Regional High School, though ultimately found her niche in the smaller, more personalized night classes offered at Londonderry High School. This year’s graduates are: Edward Anderson, Adam Brennan, Nicole Butchman, Aria Chetwynd, Ian DeLorme, Brittany DiBenedetto, Bianca Fahlin, William Fanjoy, Nicholas Ferrick, Ryan Francouer, Nicole Giorgi, Damein Lacasse, Maxwell Morlock, Kayla Peabody, Jianna Spina, Hanna VanHam and Erika Wiggins.